If the |collapse_state= parameter in the template on this page is not set, the template's initial visibility is taken from the |default= parameter in the Collapsible option template. For the template on this page, that currently evaluates to autocollapse. Orem is a city in Utah County, United States, in the north-central part of the state. It is adjacent to Provo and Vineyard and is about 45 miles south of Salt Lake City, Orem is one of the principal cities of the Provo-Orem, Utah Metropolitan Statistical Area, which includes all of Utah and Juab counties. The population was 84,324 at the 2000 census, while the 2010 population was 88,328 making it the fifth-largest city in Utah, Utah Valley University is located in Orem. The Orem Owlz of the minor league baseball Pioneer League play their games at the college. Orem uses the slogan Family City USA, in 2010 Forbes rated it the 5th best place to raise a family. Also, Time magazine rated the Provo-Orem area as the best place to live for spiritual well-being, another former name was Provo Bench. In an apparent attempt to more investment to the town and provide an easy way for the large population of farmers with orchards to ship produce. 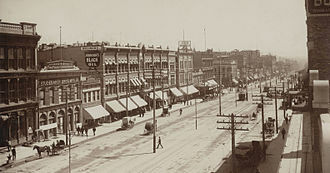 Orem, President of the Salt Lake and Utah Railroad in the early 1900s, Orem is located at 40°17′56″N 111°41′47″W. Its average elevation is 4756 feet, according to the United States Census Bureau, the city has a total area of 18.4 square miles, all of it land. The City of Orem is located on the shore of Utah Lake. It borders Provo, Utah on the east and south, and is located at the base of Mount Timpanogos, Orem is renowned for the Timpanogos Storytelling Festival, and its Summerfest celebration and parade in June is a popular local attraction. In addition, Orem has more area of parks as compared to city size than any other city in Utah. Hispanic or Latino of any race were 8. 56% of the population, the 2000 Census counted 84,324 people,23,382 households, and 19,079 families. 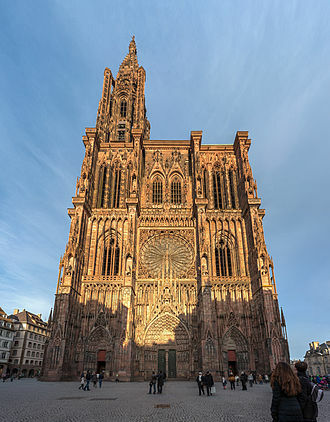 The population density at time was 4,572.6 people per square mile. There were 24,166 housing units at a density of 1,310.4 per square mile. 12. 4% of all households were made up of individuals and 5. 1% had someone living alone who was 65 years of age or older, the average household size was 3.57 and the average family size was 3.93. In the city, the population was out with 35. 4% under the age of 18,17. 4% from 18 to 24,25. 8% from 25 to 44,14. 5% from 45 to 64. Clearfield is a city in Davis County, United States. 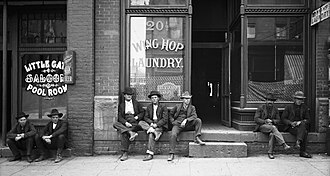 The population was 30,112 at the 2010 census, Clearfield is a principal city of the Ogden–Clearfield, Utah Metropolitan Statistical Area, which includes all of Davis and Weber counties. Clearfield was one of the last communities to be settled in the part of Davis County. Hunters and Native American Warriors knew this land before the first white man settled here and they referred to it as the land of wind and sand. There was no water for those early families until wells could be successfully dug, the only water available at first had to be hauled in large barrels from Kays Creek in East Layton. But the great event that did more to transform the bleak Sand Ridge into a garden spot was the coming of the Davis. This caused a population boom in the area as people plowed up the sagebrush and prickly pears. Many Clearfield children went to school in nearby Syracuse by walking several miles a day, in 1907, the new Clearfield Elementary School opened its doors to those same children. The school taught first through eighth grades and operated until 1923 when it was destroyed by fire, the new building acquired the name Pioneer School. North Davis Junior High School was built and opened its doors in 1939, the building cost approximately $170,000 to build. That first year, there were 18 faculty members and 585 students, throughout the following years, Clearfield was known as a peaceful farming community. However, the addition of defense installations in the changed the agricultural community. Construction began on Hill Field in 1940 and the facility eventually stretched along the border of Clearfield. The base has since provided many jobs for civilians and is one of Utahs major employers, on the southwestern side of Clearfield, the U. S. Navy installed the Clearfield Naval Supply Depot in 1943. The dry climate was ideal for storage, and there was a supply of manpower. Another more modern school, South Clearfield Elementary, was added during 1950 to help keep pace with the growing population, the early winter of 1959 saw the beginnings of Clearfield High School, the first high school in northern Davis County. St. George is a city located in the southwestern part of the U. S. state of Utah on the Utah-Arizona border, near the tri-state junction of Utah and Arizona. It is the county seat of Washington County, Utah and is the city of the St. George Metropolitan Statistical Area. The city is 118 miles northeast of Las Vegas and 300 miles south-southwest of Salt Lake City on Interstate 15, the city is named after George A. Smith, a Church of Jesus Christ of Latter Day Saints Apostle. As of the 2015 U. S Census estimates, St. George had a population of 80,202, St. George is the seventh-largest city in Utah and the most populous city in the state outside of the Wasatch Front. Today however, growth trends have once again increased at a steady pace, prior to the arrival of Europeans, the St. George area was inhabited by the Virgin River Anasazi and by the Paiute tribe. 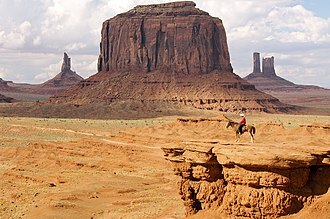 The first Europeans in the area were part of the Dominguez–Escalante Expedition in 1776, at the outbreak of the American Civil War in 1861, Brigham Young organized the settlement of what is now Washington County, Utah. Fearing that the war would take away the cotton supply, he plans for raising enough in this southwestern country to supply the needs of his people. Enough favorable reports had come to him from this warm region below the rim of the Great Basin, at the general church conference in Salt Lake City on October 6th,1861, about three hundred families were called to the Dixie mission to promote the cotton industry. The families were selected so as to ensure the communities the right number of farmers, blacksmiths, educators, the settlement was named after George A. Smith, an apostle of the Church of Jesus Christ of Latter-day Saints. 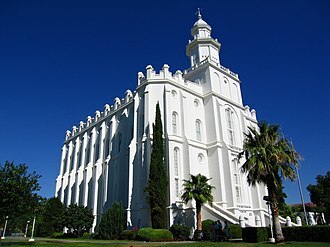 In April 1877, the LDS Church completed the St George and it is the Churchs third temple, and it is the longest continually operating LDS temple in southern Utah, and in the world. One person was killed and twenty-eight homes were destroyed by the raging Santa Clara River, St. George received the brunt of the fallout of above-ground nuclear testing in the Yucca Flats/Nevada Test Site northwest of Las Vegas in the early 1950s. Springville is a city in Utah County, United States that is part of the Provo-Orem Metropolitan Statistical Area. The population was 29,466 at the 2010 census, a few minutes drive south of Provo, Springville is a bedroom community for commuters who work in the Provo-Orem and Salt Lake City metropolitan areas. Other neighboring cities include Spanish Fork and Mapleton, Springville has the nickname of Art City. 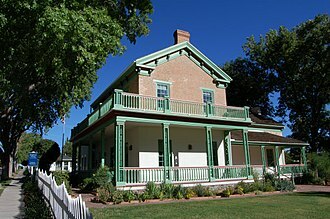 Springville was first explored in 1776 by Father Silvestre Vélez de Escalante, what became Springville, lay along the wagon route called the Mormon Road that Mormon pioneers and 49ers traveled through southern Utah, northern Arizona, southern Nevada and Southern California. From 1855, each winter trains of freight wagons traveled on this road across the deserts between Los Angeles and Salt Lake City until the late 1860s when the arrived in Utah. Incorporated in February 1853, the city was first called Hobble Creek by the pioneers, because their horses were often hobbled. If the horses wandered into the creek, the hobbles came off in the water, the settlement earned its original name. Later, as the town grew, the name was changed to Springville, Fort Springville was named such because of the many freshwater springs in the area, particularly near the fort. The original name was not completely lost, however, as the stream, a local elementary school. Springville is known as Art City due to its development of the arts. Springville is home to the Springville Museum of Art, Utahs oldest museum for the fine arts. Springville is the birthplace of noted sculptor Cyrus Dallin, the main street is dotted with bronze statues, including several from local sculptors Gary Price and Jeff Decker. Springville is a community which has experienced steady growth over the past ten years. According to the United States Census Bureau, the city has an area of 14.4 square miles, of which 14.4 square miles is land and 0.04 square miles. Springville is located on the west side of the Wasatch Mountain Range and 3 miles east of the shoreline of Utah Lake. As of the census of 2000, there were 20,424 people,5,975 households, the population density was 1,770.5 people per square mile. The San Rafael Swell is a large geologic feature located in south-central Utah about 30 miles west of Green River, Utah. Since that time, infrequent but powerful flash floods have eroded the sedimentary rocks into numerous valleys, gorges, the swell is part of the Colorado Plateau physiographic region. Interstate 70 divides the Swell into northern and southern sections, the swell lies entirely within Emery County. The Dirty Devil River flows southward into the Colorado River, while the San Rafael River joins the Green River before it flows into the Colorado. Muddy Creek cuts into the edge of the Swell, exits at Muddy Creek Gorge. The San Rafael Swell was formed when deeply buried Precambrian dike swarm rocks faulted, or broke, during the Laramide orogeny, about 60 million years ago. These basement rocks below the present-day Swell moved upwards relative to the surrounding areas, the resulting structure is analogous to a series of blankets draped over a box. 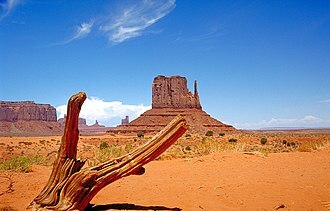 Many of the most impressive landforms are composed of resistant rocks, including the Jurassic Navajo Sandstone, Jurassic Wingate Sandstone. The folding is much steeper on the edge of the Swell than in the west. Part of the Swell has geographic features that resemble Mars, the Mars Society decided to set up the Mars Desert Research Station in the area as a Mars analog for such reasons. 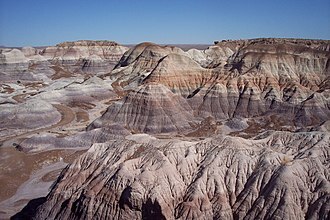 The San Rafael Swell is an area of plant endemism. An example is the endangered San Rafael cactus, evidence of Native American cultures, including the Fremont and Ute, is common throughout the San Rafael Swell in the form of pictograph and petroglyph panels. An example is the Buckhorn Draw Pictograph Panel, with rock art left by the Barrier Canyon Culture, from about 1776 to the mid-1850s the Old Spanish Trail trade route passed through the Swell. In the past 150 years, areas of the Swell have been used for the grazing of sheep and cattle, many of the gravel roads in the interior of the swell were originally used to service the uranium mining activities. Although surrounded by the communities of Price, Green River, Ferron, Castle Dale, and Huntington, the Swell itself does not support permanent residents. Cedar City is a city in Iron County, United States,250 miles south of Salt Lake City, and 180 miles north of Las Vegas on Interstate 15. It is the home of Southern Utah University, the Utah Shakespeare Festival, the Utah Summer Games, the Neil Simon Theatre Festival, as of the 2010 census, the city had a total population of 28,857. Ancestors of the present-day southern Paiute Indians met the Dominguez–Escalante Expedition in this area in 1776, fifty years later, in 1826, mountain man and fur trader Jedediah Smith traveled through the area exploring a route from Utah to California. Cedar City was originally settled in late 1851 by Mormon pioneers originating from Parowan, who were sent to build an iron works. The site, known as Fort Cedar or Cedar City, was equidistant from vast iron deposits 10 miles west and coal resources 10 miles up Cedar Canyon, but was named after the abundant local trees. Two companies of men led by Henry Lunt reached the site in a blizzard on November 11,1851. In 1855, a new site, closer to the works and out of the flood plain of Coal Creek, was established at the suggestion of Brigham Young. Cedar City was incorporated on February 18,1868, the iron works closed in 1858, though iron mining continued in the area until the 1980s. Cedar City continues to be a center of tourism, commercial development, the city has shared in the rapid growth of much of Southwestern Utah since the late 1980s. Cedar City is located in the southeast Great Basin, and is about 20 miles north of the edge of the Mojave Desert. Its elevation of 5,840 feet gives it a cooler and less arid climate vis-à-vis nearby Dixie, Cedar City is located at 37°4057 North, 113°428 West. According to the United States Census Bureau, the city has an area of 20.1 square miles. 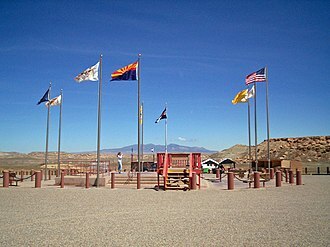 The city is located on the edge of the Markagunt Plateau, in a high desert valley, Cedar Valley. 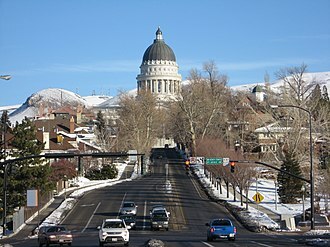 The climate is the typical cool semi-arid climate of the Mountain West, though snowfall can be quite heavy, Interstate 15 connects the city with St. George and Las Vegas to the south, and to Interstate 70 and Salt Lake City to the north. State roads connect Cedar City with Panaca, Nevada near US93, Utah via US-89, similar to St.
Lehi is a city in Utah County, United States. It is named after Lehi, a prophet in the Book of Mormon, the population was 47,407 at the 2010 census, up from 19,028 in 2000. The center of population of Utah is located in Lehi, Lehi is part of the Provo−Orem Metropolitan Statistical Area. A group of Mormon pioneers settled the area now known as Lehi in the fall of 1850, at a place called Dry Creek and it was renamed Evansville in 1851, after David Evans, a local bishop in The Church of Jesus Christ of Latter-day Saints. Other historical names include Sulphur Springs and Snows Springs, the land was organized into parcels of 40 acres, and new settlers received a plot of this size until the entire tract was exhausted. There was little water to irrigate the rich soil, so it became necessary to divert a portion of American Fork Creek, Evansville consumed up to one-third of the creeks water as authorized by the Utah Territorial Legislature. The settlement grew so rapidly that in early 1852, Bishop David Evans petitioned the Utah Territorial Legislature to incorporate the settlement, Lehi City was incorporated by legislative act on February 5,1852. It was the city incorporated in Utah. The legislature approved a request to call the new city Lehi, the downtown area has been designated the Lehi Main Street Historic District by the National Park Service, and is on the National Register of Historic Places. According to the United States Census Bureau, the city has an area of 26.7 square miles, of which 26.3 square miles is land and 0.35 square miles. I-15 runs through Lehi, with four located in the city. The Utah Transit Authority operates a bus system that reaches into the city, work on the FrontRunner South commuter rail began in August 2008 and the Lehi station opened for service on December 12,2012. The Lehi station is located near Thanksgiving Point, as of the census of 2000, there were 19,028 people,5,125 households, and 4,602 families residing in the city. The average population density was 936.2 people per square mile, there were 5,280 housing units at an average density of 259.8 per square mile. Hispanic or Latino of any race were 2. 99% of the population,8. 9% of all households were made up of individuals and 3. 5% had someone living alone who was 65 years of age or older. Bountiful is a city in Davis County, United States. As of the 2010 census, the city population was 42,552, the city grew rapidly during the suburb growth of the late 1940s, 1950s, and 1960s and was Davis Countys largest city until 1985 when it was surpassed by Layton. Bountiful is currently Utahs 15th largest city, although a part of the Ogden-Clearfield Metropolitan Statistical Area, it serves as a bedroom community to Salt Lake City and the surrounding area. However, due to the narrow entrance into Salt Lake County. The FrontRunner commuter rail has been running since April 2008, and these were built to help alleviate the traffic load on Interstate 15 through the Bountiful area. Bountiful was settled on September 27,1847, by Perrigrine Sessions and it was Utahs second settlement after Salt Lake City. 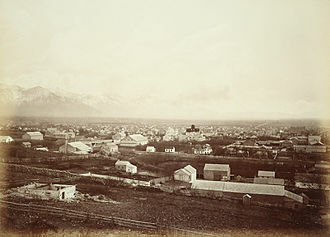 It was known as both Sessions Settlement and North Canyon Ward before being named Bountiful in 1855 and this city was so named both because of the citys reputation as a garden place and because Bountiful is the name of a city in the Book of Mormon. Most of the settlers, and most of the present inhabitants, are members of The Church of Jesus Christ of Latter-day Saints, the Bountiful Utah Temple was dedicated in 1995 by the LDS Church. A tabernacle of The Church of Jesus Christ of Latter-day Saints is located in Bountiful, the city was incorporated in 1892 with Joseph L Holbrook as mayor. In 1907 electric lights came to Bountiful through the efforts of its citizens, notorious serial killer Ted Bundy snatched victim Debra Kent from Viewmont High School in Bountiful on November 8,1974. The city maintains a charming Main Street, with locally owned shops. The city celebrates its history at the annual Handcart Days celebration every July in conjunction with U. S. State of Utah’s official holiday, Bountiful Handcart Days is a volunteer–driven event. People from three cities in the south of Davis County, Utah come together to commemorate the first group of Mormon Pioneers’ entry into the Salt Lake Valley on July 24,1847. 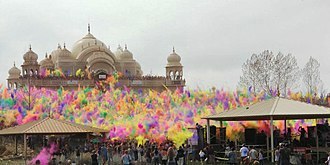 The festivities include a parade, games, entertainment, an art exhibit, according to the United States Census Bureau, the city has a total area of 13.5 square miles, all of it land. The desert's white salt is depicted in Utah's northwest. The old city hall is on the National Register of Historic Places. Aerial photo of Cedar City. Pleasant Grove with Utah Lake in the background. Pleasant Grove High School can be seen in the foreground. The St. George Utah Temple of The Church of Jesus Christ of Latter-day Saints was completed in 1877. Memorial to Springville, Utah's pioneer mothers. It was unveiled in 1932 by sculptor Cyrus Dallin, who had been born in Springville in 1861. Springville Public Library with view of Wasatch Range in background. This view of Kings Peak and the Henry's Fork Basin shows the cliff bands and basins typical throughout the Uintas. A display at the Utah State Capitol describing the history of the flag.